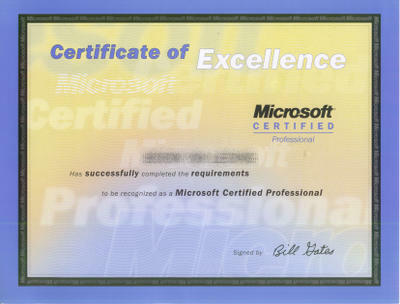 My MCP Cert and welcome kit finally arrived. I almost thought it will take forever. Well, it says Bill Gates on the signature. :P This will be the first and many more to come signed by him I guess. I only hope I have the chance to take them quickly because I had been tired up by many things recently. What? Thats a secret. The time is not right yet to talk about it.